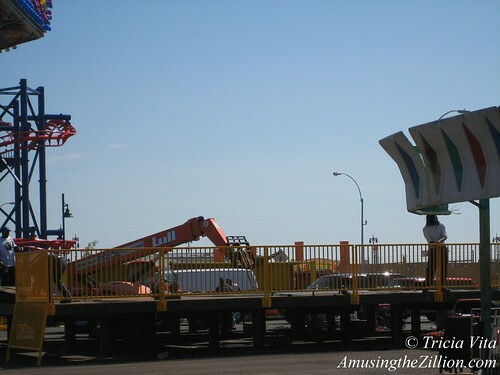 ATZ snapped these photos over the weekend of the MegaWhirl under construction on the BK Festival lot in Coney Island. Set up in the center of the Stillwell East lot, the ride platform is surrounded by amusement rides including a Himalaya and Bumper Cars from Castle Rock Shows. 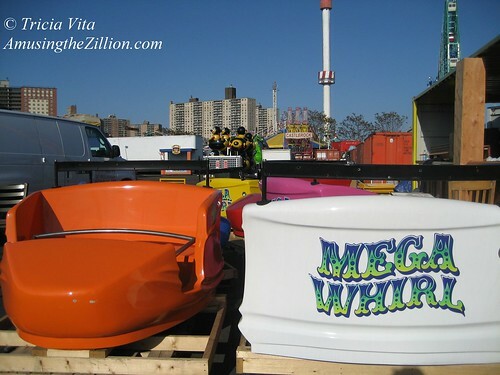 As previously reported, the MegaWhirl, a prototype ride described as combining the thrill of the Whip and the Tilt, is expected to make its debut on Memorial Day Weekend. Designed by Jonathan Gordon of Gordon Rides, the prototype was built by Larson International and was previously set up on the factory floor at Larson’s headquarters in Texas. Thor Equities’ Stillwell Avenue lots were leased to the BK Festival promoters for last year’s flea market and this year’s new Steeplechase Park. Will McCarthy, event director of the BK festival, tells ATZ that the flea market didn’t mesh with the Coney Island location and this season the BK Festival will bring in rides and amusements along with a smaller number of vendors.